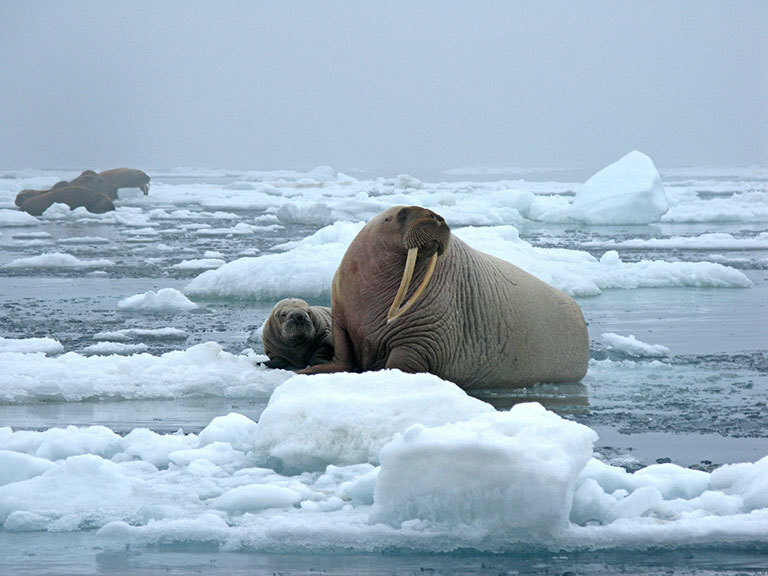 Walruses caught out by swiftly melting ice. From NASA website. The story has recently broken through the MSM that we’ve reached 400 parts Per Million of carbon dioxide in Mister atmosphere. The thing we breathe. We’d hit the number before but we hadn’t stayed at it for a month the way we did in April. 400 is the new normal. 350 is so ‘last century’. The story hit a number of mainstream websites including Huffington Post, but what’s missing in all the stories is why this matters. Depending on who you talk to in the science community, the planet hasn’t been at 400 since well before humans were here (perhaps several million years ago). And 400 PPM goes hand in hand with some other dire truths–the last time we had sustained rates of 400 PPM, sea level was a few dozen meters higher (Arctic ice was gone) and temperatures were upwards of 3c warmer on average. The heating has come tremendously fast, but the rest of the world’s mechanisms will ultimately catch up. Moreover, there’s nobody in the science biz telling us we can shrink that 400 PPM anytime soon. Absent some amazing technology breakthrough, we’re stuck with that for centuries. And (saving the worst for last) there are precious few people in the science community coming out and saying what people like Guy McPherson have been saying for nearly a decade. Mainly, if we’re looking at 3c higher temperatures and much higher sea levels, we’re facing extinction of big mammals. Google ‘wet bulb temperature’, when heat is so intense in humid climates that people can’t cool off through sweating. That would be true of many other places in the planet. And what would happen to the fur-bearing mammals, who can’t thermo-regulate through sweat? Would they be eaten by the bus-sized reptiles that would thrive in such an environment? And yet, we’re still using that ‘climate change’ phrase, something that was invented by a Republican strategist named Frank Luntz. Now why would the GOP want to invent a term like ‘Climate Change’? Because in 2002 (per Luntz’ polling) the Repubs were taking huge heat (pardon the pun) over their responsibility for global warming. But here’s the point of this whole flippin’ post. And it’s not about the total denialist folks I listed above. And it’s not about word play–‘climate change’ vs ‘global warming’ or even (seen recently) global climate collapse. If you’re a credentialed scientist and you understand the biology of the clever ape, why are you resorting to euphemisms? If you’re putting out a warning that global temperature is on track to go up past 3c over baseline, why aren’t you using the word ‘extinction’? If you picked an evolutionary biologist at random and woke him up late at night, he’d be furious. But then you’d ask the question–can humans (and human habitat) survive average temperatures that are higher than they’ve been at for at least three million years? And then you’d wait for the answer. And as long as the scientist was being honest with you (and not humoring you while he/she called 911), the variables do add up to extinction. So why is the word ‘extinction’ off limit? People may not understand ‘wet bulb temperatures‘ and ‘ocean acidification‘, but they understand the E word. I leave you with news from Fukushima, where (as I’ve mentioned recently) the E word is becoming more and more appropriate. A recent video posted about the lack of honesty by the Japanese government carried the claim that an honest assessment of the radiation output from the plants starting back in 2011 would necessitate the evacuation of some 35 million Japanese from Tokyo. No government in the industrialized world has the capacity to evacuate that many people in an orderly fashion, and Japan’s already claustrophobic islands leave open the question ‘evacuate them where?’. Some reporters are now writing that the decision has been made to prevaricate and protect the status quo, even as the truth worms its way out. Since there’s no solution to Japan’s dilemma, what else would they do? And is that the thought process behind the media’s willingness to not call out bad climate news as a portent for human extinction? If one accepts the idea that people in charge surely know what’s going on, is the goal here to avoid any news that is transparent and open about our flirtation with extinction? This post is fear-mongering. Not that there isn’t plenty to be frightened about, but stick to the facts. The reason that “there are precious few people in the science community coming out and saying what people like Guy McPherson” is saying, i.e. that humans will be extinct in a few decades, is that McPherson has stopped doing science and has become more of a cult leader. He cobbles together bits and pieces of “evidence” from often questionable sources and reaches unjustifiable conclusions that he refuses to defend. Question the basis of his “work” and he’ll just call you names. And where in the linked memo does it say that the phrase “climate change” was “invented” by Republican strategist Frank Luntz? Yes, I’ve seen your website. Life is too short for me to work through a point-by-point refutation. Readers are welcome to check it out on their own. A few other points. First, regarding Frank Luntz’ famous memo, there are a number of citations of the memo and his own comments. I put up the link to the memo so that people could see it themselves, but it’s been extensively written about, and anyone with Google access can look up the gestation of the ‘climate change’ phrase (‘climate change memo frank luntz’ is as good a start as any). As for my statement about ‘precious few in the scientific community’, you can find a radio interview I personally conducted with Dr. McPherson a year ago when I brought up the same topic. It should be fairly obvious by now that climate scientists are in the cross-hairs of the denialists. Naomi Oreskes and Michael Mann have both written about being vilified for stating views about climate at odds with the larger narrative, and the ‘climate-gate’ e-mail debacle has made other scientists extremely reluctant to be out front with their views. If you’re in academia (or private industry) and you want to ride off the reservation, you’d best hold off until your pension paperwork is in. Colin Campbell, geologist and founder of the Association for Study of Peak Oil is exhibit A.
Dr. McPherson has always made it clear that he’s doing secondary research. He’s not a climate scientist–his specialty is in evolutionary biology, where he would have expertise in issues such as the ability of mammals to thermo-regulate in higher temperatures (and the ability of food plants to photosynthesize). One swallow does not a summer make–individual details may be wrong, but the larger picture is of near term extinction, The central points of Dr. McPherson’s body of work hold up–we’re on the way to markedly higher temperatures than humans have seen before, and the threats of ocean heating are setting off numerous irreversible feedback loops including surges in sea level and release of methane from melting permafrost and the firing of the ‘clathrate gun’. First, it’s not my website. Yet you seem to accept McPherson’s conclusions without question, even though he has attempted no refutation and always shrugs off serious criticism as “denial”. Not sure what you’re now saying about the 2002 Frank Luntz memo, but if you’re still claiming that it was the origin of the phrase “climate change” I need only point out that the IPCC was created in 1988, and you will know what the “CC” stands for. The term has been used for a long time. Do you really accept McPherson’s notion that climate scientists secretly agree with him about near-term human extinction, but are afraid to say so? And believe that the overblown “climate-gate” has been enough to make them all hush up? I know what McPherson’s field is and what he claims to be doing. He uses the work of climate scientists selectively and in a misleading way. Of course “we’re on the way to markedly higher temperatures than humans have seen before” and ocean warming and acidification are underrated problems. But there is no evidence that the “clathrate gun”, if it exists, is firing (the Russian field researchers he likes to cite are not making such a claim), and while a significant reduction in the population from various causes can be expected in the coming decades, there is no basis for predicting the near-term human extinction that McPherson expects and welcomes. This is no time for misleading readers by disseminating the idiosyncratic views of an individual who seems more interested in self-publicity than in communicating the real facts of climate change. ← Brooklyn Culture Jam welcomes Marni Halasa!